Within the framework of the ongoing official visit to Russia on September 7, Party General Secretary Nguyen Phu Trong attended separate meetings in Moscow with leading officials of Russian oil and gas groups Gazprom and Zarubezhneft which both boast a traditional and effective cooperation with Vietnam. At the meetings, the Party chief emphasised that cooperation in the fields of oil and gas, and energy, are of strategic significance in bilateral relations, and spoke highly of the cooperation between the groups and their Vietnamese partner. 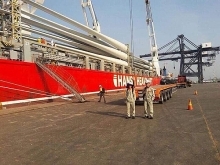 He also lauded the groups for maintaining signed contracts in an effective manner, and affirmed that Vietnam will create the best conditions for Russian firms to operate and expand their operations in Vietnam. He also expressed his belief that cooperation projects between the two sides will reap desirable outcomes and serve the common benefits of the two countries. Leaders of the two groups expressed their wish to continue the long-term cooperation with the Vietnamese side, and to broaden their cooperation to other fields such as electricity generation, environmental protection and human resources training. 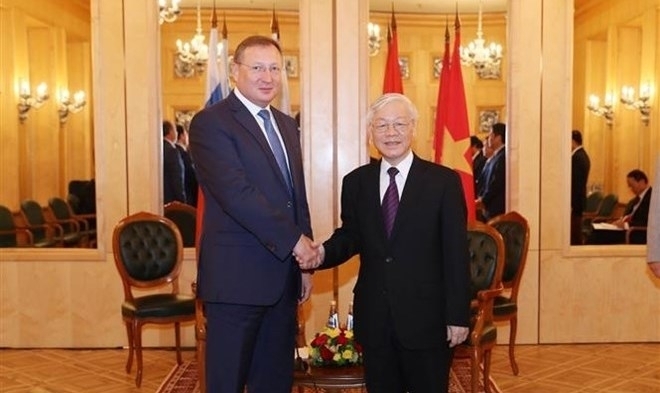 Also within the framework of Party leader Trong’s official visit to Russia, Minister of Justice Le Thanh Long met with his Russian counterpart, Konovalov Alexandr Vladimirovich, in Moscow on the same day. 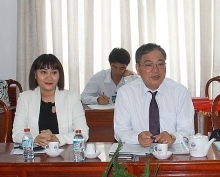 The two ministers agreed to continue effectively implementing the cooperation programme for the 2018-2019 period, under which the two sides will boost the sharing of experience, continuing to effectively implement the legal and justice support agreement, and the Russian side will continue to provide scholarships for Vietnamese students.